In the 80s of India, one could have had a more resourceful life living in the villages than in the so-called cities. Growing up in one such city, Chennai, was no easy challenge. It had the dubious distinction of being a metropolitan city, one among four other cities in India where something related to development happened in an otherwise laid back country. Chennai however was less crowded and more manageable a city back then, compared to its peers. This didn’t mean that Madras (as it was called then before being renamed to Chennai) had it all great. A perennial and persistent problem was the access to clean water. To solve that, the local government came up with a system that provided water only during a stipulated time frame. The tool used for accessing the water was a manual hand pump. The time frame chosen was four in the morning every alternate day for about an hour or more. When you are about ten years old, you sleep well. By that I mean, you sleep more and more as someone tries to wake you up. The desire for getting even a few additional minutes of shut eye is one of the greatest desires a kid of that age has. I had mine too as the sound of water overflowing from the released high pressure valve begins to kindle your senses at four in the morning. This was followed by the overzealous neighbor and his sidekick, his son, starting to pump their hand pump with loud strikes. The pattern of sound is one of the most depressing event of your life, especially when you have to wake up to its inviting music. The neighborhood’s goal is to maximize the volume of water that comes from the pressure that slowly keeps dying until the slackers don’t get any. The more you pump water for yourself, the less the other neighbor gets. Hence, the chimp like strikes on the hand pump by my next door neighbor. There were two large cement holders in which water had to be pumped and filled in in my home. It then had to be filled in colorful buckets that were all lined up in a sequence for easy transport into the house. This hand pump, painted in cream yellow, had it owns age-related problems. The rubber bracket that enabled water pressure to hold, would give way if not handled with love. 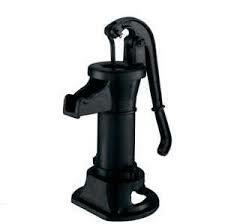 You pump too hard, and the whole metal handle could be yours to keep separated from the pump. If you take a break from constantly pumping, you give away the water pressure you have maintained in your pump, and donate it to the neighbor who has worked hard on pumping his own. Water lost by you is water gained by someone. Since all the families in the neighborhood loved each other, we made sure that we never let the pressure fall in our pump. This gives an idea of the privilege one had living in a city, the urban India of the 80s that great journalists like Sainath P have hammered mercilessly in favor of the poor rural counterparts. Indians were all like hippos in a drying river bed. You should get the idea of what that looks like and means! My mother woke me up at around five or a quarter to five if things looked bleak. This usually meant dad was not at home working on the pump already or the pace at which my sisters were filling the buckets was not helpful in maintaining the competitive position once gained to get water. There was no stretching and snuggling around on bed, which anyways wasn’t available for me as the only twin-sized bed was enough for just my two sisters to fit in. I slept on a mattress laid on the floor. It was all action the moment the eyes opened. I was faster than a wildebeest calf in getting up and running, just after being born a few minutes ago. Once you hold the now warm handle of the pump, the idea of sleep is lost anyways for good. There is something about holding a pump by its handle and hitting it at a special angle to start regaining the lost water pressure and then maintaining that symphony by calling out for the next empty bucket to be ready for you and getting it right under the nozzle and keep chugging along until the final call came from inside that there were no more empty buckets or even utensils to fill. At around that time, there are a group of kids and women who come from the lesser privileged part of the street on which I lived. They lived in one room houses while I lived in a three room one, each the size of a matchbox. They didn’t have their personal hand pump exclusive to their home. This made you realize what luxury is all about and that wealth is anyways relative. These kids came with their empty buckets and asked around the houses after sensing that the water is still available and is being unused. My next door neighbor’s son somehow could never find a reason to let go of his pump and his pumping action. The water had to be pumped even if not needed for the house as the pump was still giving water. Sometimes you just get used to the act of doing something even if it produces meaningless results. Finally, as always the government intervenes. As dawn breaks, the pressure is gone, the water is down to a disappearing trickle and the mighty hand pump finally gets to rest in its state of complete uselessness, at least until it becomes valuable again. Water makes you desperate and disciplined in life. Madras had a great lesson to offer everyone so early in the morning. Indian Tales: So, what did you do over the weekend? Prashnat on What is a Payment Gateway?